The jetstream is still running across the Pacific and is pushing moisture/clouds over Northern California. Today Northern California will be partly cloudy to cloudy with scattered light showers. Snow levels will be 5000 to 6000 feet. Sunday we will see partly cloudy to cloudy skies with a few showers over the coastal and northern mountains. Monday afternoon and Tuesday a low pressure trough will move across the area. This system will bring more light showers to all areas except the valley south of Chico. Snow levels will be above 6000 feet. Wednesday we will see a brief break the valley will be sunny with some clouds over the mountains. 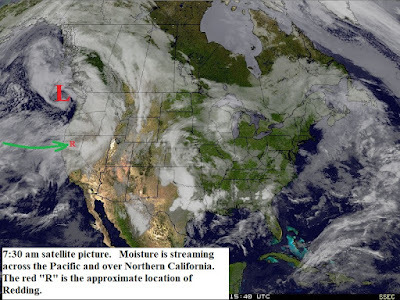 Thursday and Friday a low pressure area will drop southward over Northern California (see map below). This system will be a little colder but will not have much moisture with it. Scattered showers are expected over the foothills and mountains with snow levels near 4000 feet. A stronger low pressure trough will move through late Saturday and Sunday.